You’ve been fortunate to have some rich experiences at a relatively young age. How did such doors open for you? I’ve very blessed to have people in my life who lead by example and inspire me to work as hard as I do. If I hadn’t seen my parents work relentlessly to give us the best, have a good circle of mentors and friends then I would not be who I am today. I’m constantly motivated and inspired. As a black African woman, I’ve learned that if you don’t advocate, promote yourself, know your worth etc then you will easily get walked over. I’ve learned that opportunities will not be delivered into your lap; you have to create them. Your work quality, persistence, and consistency will determine the end result. You are involved in a lot of media, but photography seems to be very close to your heart, why is that so special? We moved to the United States from Kenya when I was two and lived in Kansas till I was 15 when we moved to Oregon. Being a young teen, it was very hard moving away from the dear people I’d known all my life. I struggled to adjust and felt sorry for myself. Fortunately, I gained three incredible mentors at my high school who talked me out of the pity party. One of my mentors, told me to join yearbook to connect and meet people. That’s how I completely fell in love with photography. Every free moment I had was used to practice my craft. My family, friends, nature and objects were all used as my muses. I worked at McDonalds as a cashier for almost two years to purchase my only camera and an old laptop. The rest was history. I’m so thankful for everyone who encouraged me to explore what interested me. I never imagined that I could earn anything or travel by taking pictures. I mean as an African, the routes I am supposed to follow are lawyer, doctor and engineering (laughs). My mentor showed me several photojournalists, schools etc to help put it in prescriptive. I used photography as a way to positively cope with my hard transition to Oregon. No matter what I do, photography will always be a part of it. You are yet to complete your university education but have had a lot of exposure to the world of work. What are some of the most important lessons you are learning about work and life that others might learn from? Time-management, self-care and learning to say ‘no’ are some of the biggest lessons I’ve learned. As an ambitious person, I used to take on more than I could handle and would say ‘yes’ to every opportunity. Honestly, some of the stuff weren’t really opportunities; it was me doing things for free for ‘exposure’ or for building my ‘portfolio’. That said, I have learnt that knowing my worth and what I can bring to the table is important. You learn these things from going through them and coming out stronger and wiser. That is one reason why mentorship is so important because with a great mentor, you can learn from their mistakes and limit some of these tough life lessons. You are offering social media expertise to quite a few notable US organizations including Def Jam recordings. What are some of the tips you can offer on how social media can be used for social good/change? Social media can be both a good or bad thing. The women behind the ‘’Black Lives Matter’’ movement are a prime example of using social media to bring about social change in a national context. It simply started out as a hashtag then turned into a worldwide conversation on issues that have been occurring for decades. It helped wake people up and educate the world on issues like police brutality. I think it’s important to reflect on your intentions of a post, what message you’ll be spreading and whom you could potentially impact (good or bad) before you publish a post. How do you leverage the influence you have as a young successful person especially with the social media platform? That is something I am still learning and working on doing. I lived in Kansas and now in Oregon, both states are not the best for media and entertainment. I’ve used social media platforms (Twitter, FB, Periscope, Snapchat etc) as a way to learn and connect with others who are doing what I would love to do. I’m trying to create a distinct brand voice that will translate across all my platforms. It is a daily work-in-progress, but I feel like people are starting to listen to what I have to say. I hope that I can gain a bigger platform so that I can use my influence for positive change in my communities. As a young African woman with all the signs that you’re going places, what are your dreams for Africa and what do you think young people like yourself can do to help develop the continent? Thank you; and that is a great question. I would love to see a healthy, educated, peaceful and corrupt-free Africa. I would love to see my brothers and sister have self-love and not feel the need to fit with the western standard of beauty. I believe Africans are potentially rich and it hurts to see people in poverty and for example not receiving proper medical care or access to good education. One of the strengths that we young people need to use to bring about change is our understanding of technology and social media. We first need to educate ourselves, develop strong relationships with influential people and then go back to our roots and work on one thing at a time. These things will take time and patience. We must be the change. What’s the biggest challenge you’ve faced and how did you handle it? Hmm, I think that my biggest challenges have been things you can’t fix with what you learn in school. They are things such as Self-love, confidence, knowing my worth, limiting doubt and negative thoughts, removing toxic relationships etc. These are challenges that will look different for each person but help make you a better person. I am fortunate to have lived in a steady and positive home environment. For the most part, I’ve always had good influences around me so I see others lead by example. I’m a Christian and my faith is really why I am here today. To say I am ‘’Blessed’’ is an understatement. I don’t take any of this for granted. What do you think it takes to be an effective young leader today and what can young leaders teach older ones? To be an effective leader, you need to be able to listen. Put down the smart phones, stop making it about yourself. You must know yourself and your stuff. You must be honest and learn how to communicate well. You have to read and study the greats. I think young people are teaching older folks to embrace and adapt to change. Where do you see yourself in 5 years and why is that ambition important? You’ve got to have a reason to wake up to every morning. In a weird way, it is kind of thrilling to set goals, achieve them and then set new goals. I simply cannot wait for the day that I am able to support myself and family with income from my craft and skills. I want to be able to do what I love full-time. I want to be able to have traveling as my main occupation. I want to be an inspiration to my future kids and generations and to make an actual difference in other lives. I hope that I can show people it is possible. 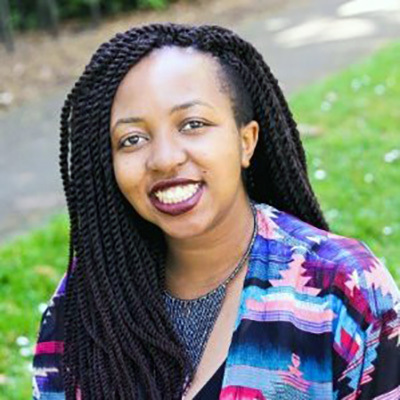 This entry was posted in Interviews and tagged personal achievement, polly irungu, women in social media, women role model, women4Africa awards, young women leaders. Bookmark the permalink.